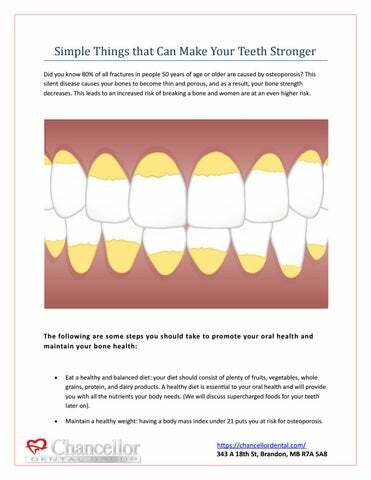 Simple Things that Can Make Your Teeth Stronger Did you know 80% of all fractures in people 50 years of age or older are caused by osteoporosis? This silent disease causes your bones to become thin and porous, and as a result, your bone strength decreases. This leads to an increased risk of breaking a bone and women are at an even higher risk. Eat a healthy and balanced diet: your diet should consist of plenty of fruits, vegetables, whole grains, protein, and dairy products. A healthy diet is essential to your oral health and will provide you with all the nutrients your body needs. (We will discuss supercharged foods for your teeth later on). Maintain a healthy weight: having a body mass index under 21 puts you at risk for osteoporosis. Have calcium every day: you should have between 1000 to 1200 milligrams (mg) of calcium per day. Your source of calcium should come from your diet and you should only take a supplement if it’s necessary. Get some Vitamin D: you should have between 600 to 800 IU of vitamin D per day. A vitamin D supplement is recommended. Exercise: weight-bearing and resistance exercises in specific are important for countering osteoporosis. Quit smoking: smoking can interfere with your absorption of calcium and increases the rate of bone loss. Additionally, tobacco puts you at risk for gum disease and oral cancer. 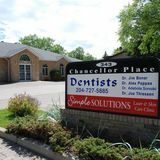 Visit your dentist in Brandon regularly: you should schedule professional dental cleanings and examinations every 6 months. Let’s take a look at 4 different foods that can help to build healthier teeth and gums. Note, the following are only dietary recommendations. You should always ensure you are practicing good oral hygiene and visiting your dentist in Brandon regularly. Cheese If you are a cheese lover, you’ll be delighted to hear that cheese is a superfood for your teeth. This is because it combats acid erosion of your teeth. Fish As you know, calcium protects your teeth and gums from disease. However, without enough vitamin D in your body, you can’t properly absorb calcium. Oranges Confused how this citrus fruit would be good for your oral health? The vitamin C in oranges strengthens your blood vessels and connective tissues, thus slowing the progression of gum disease by reducing inflammation. Dark Chocolate Now before you get too excited, there are a few conditions… The chocolate must contain at least 70% cacao and be eaten in moderation.